The first time I marveled at stained-glass and felt the depth of its theological significance, I was a 15-year-old teenager walking amid the ruins of a bombed out church in the former Yugoslavia. I remember stumbling over rubble and seeing the shattered beauty of what had formerly been a stained-glass window. Beautiful sapphire blue and emerald bespeckled the ruins, peaking out among the twisted iron and broken stone, still doing what is it had been created to do – signifying and pointing to the sacred. No other sign was needed, we knew by the presence of the glass that this was the house of God. Picking them up, piece-by-piece, I could feel the weight of their significance; and they seemed to tell their story. Each fragment spoke of the vicious destruction of this house of God and each splinter was a witness to the thousands of hearts that had previously gazed upon them to glimpse eternity. For many Catholics, the sight of stained-glass windows in a church is as ordinary as the pews within. If we notice them at all, aside from the splash of color they emit, we may be hard-pressed to remember what images they contain: a saint? some symbols? the Blessed Mother? Though it has become a lost tradition of our faith, stained- glass windows, since the time of the Middle Ages, have had a very particular and important job to do. Indeed, everything about them served a purpose. When stained-glass windows began to grace the interiors of churches, they weren’t there merely for decoration. The faithful of the Middle Ages lived lives marked with the darkness and toil of those harsh times; illiteracy often blocked the way to the light of knowledge, and their visual experiences were limited to the day in and day out toil of their existence. How could one catechize the multitudes effectively and yet express the glory of their faith? How could one teach the truths and history of the faith in a way that they would remember? Stained-glass windows. The churches of the Middle Ages would provide the one experience and opportunity that would transcend the faithful to light and eternity. The Mass in the medieval church, adorned with the beauty and magnificence of stained-glass would elevate the faithful out of a literal and figurative darkness, while providing a visual feast of light playing upon light. As the sun rose through colored windows, the life of Christ and his Blessed Mother, the truths of the faith, the history of the Church and Biblical events and teachings that would have been read to them from the scriptures would gleam before them and illumine their minds and senses to the heavenly. 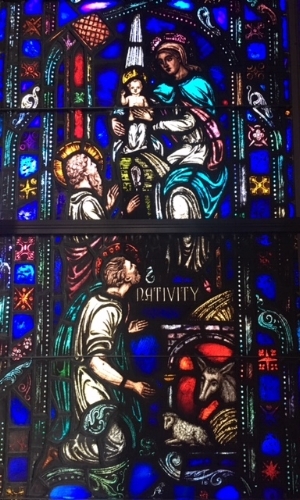 The priest would actively use these windows as a “catechetical textbook,” and before their eyes, these events and teachings would come to life in an ethereal rainbow of light. Medieval cathedrals and chapels across Europe continue to provide this mystical and theological experience to all who enter their doors. Uniting time and space, travelers today stand in the same naves that lifted the illiterate Christians of the Middle Ages to a new heaven, while opening their eyes and hearts to the truths of their faith and the utter glory of God. Today, a stroll through Paris provides the most exquisite examples of the evocative power of medieval stained-glass. Sainte Chapelle, built in the 13th century to house the sacred relics of Christ’s passion acquired by Saint Louis, boasts 1,113 stained-glass windows. This breath-taking chapel was built to resemble, fittingly, a jeweled reliquary. Chartres Cathedral, whose very architecture was designed to hold large unbroken spaces of windows, holds the largest collection of medieval stained-glass. This is a rarity not only because of its age, but also because of the targeted destruction of stained-glass windows during the Reformation, precisely because of their power to teach the truths of the Catholic faith. Its famous North Rose window, displays the Virgin Mary with the child Jesus, surrounded by angels, encircled by the twelve major prophets, each number, pattern and color holding significance and symbolism for the medieval viewer.